This art is a draft of a development of a sphere, which includes mathematical and geometrical elements. 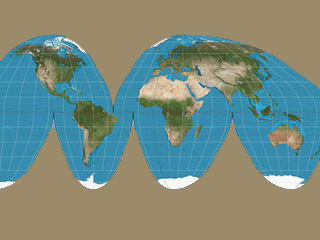 The most familiar example is a world map expressed as a globe is expressed as a plane, which is a projection of a sphere. In fact, Mr. Okada has won a special award of the first original map contest. When I was little, my mother showed me the globe and the world map and told me that these two were the same things. She rolled the world map and showed me that(note) the American continent and Africa were neighbors over the Atlantic Ocean. I was moved to know that, which may have given me a kind of motivation of my Orange Origami Art. (note)The world map sold in Japan shows the Pacific Ocean in the center and the Atlantic Ocean is located at the right and left edge. 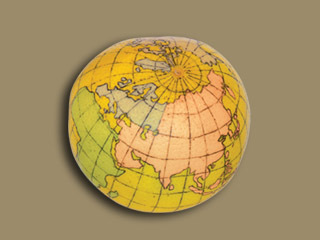 This is a globe drawn on the surface of a grapefruit, as the longitudinal and latitudinal lines are written with the hull as a north pole. As you make a cut according to the lines, a horse will appear as in the photo. 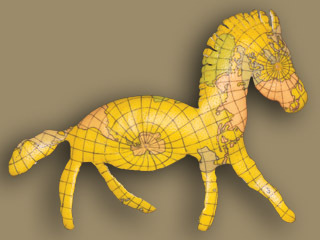 The shape is a horse but the designs inside is a world map. Yes, a accurate world map gets born out of this. This method of development can be called as grapefruit & horse type equal-area map projection. If an orange is a globe, you are making a world map each time you eat one. Science is included in the ordinary act of peeling and eating a fruit. Also, if you peel one with intentions instead of at random, art and science can encounter with each other there.